Fast forward to today. We want more jobs -- that is to say more hours of work --but we want less greenhouse gas emissions. We face not only a paradox but a dilemma. The horns of this dilemma are yoked together, not just "in principle" but in the physical, mechanical agent of both the economy of fuel and the economy of labor: the machine. "When we try to pick out anything by itself, we find it hitched to everything else in the Universe," is how John Muir put it. The Image below is NOT the old "Charter of Industrial Freedom." It is instead an editorial by Samuel Gompers that appeared in the A.F. 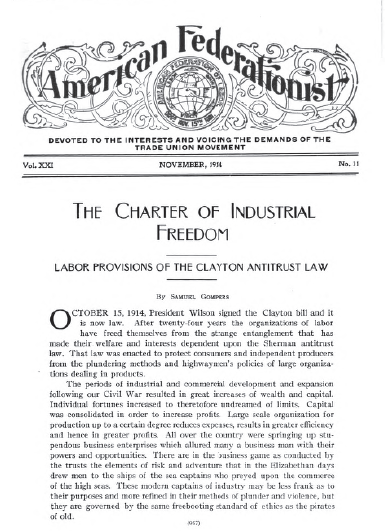 of L. Federationist lauding the labor provisions of the Clayton Antitrust Act as the Charter of Industrial Freedom -- an "industrial Magna Carta," no less! As Charters go, the memorable part was the proclamation in Section 6, "That the labor of a human being is not a commodity or article of commerce." It was a noble sentiment but, as discussed previously, had negligible traction as legal doctrine. For the New Charter of Industrial Freedom, I'm going to suggest something entirely different from lofty phrases and woolly intentions. In fact, I'm going to take liberties with the notion of a "Charter" and suggest something more akin to a chart of accounts than to a manifesto. The trouble with manifestos or any other sort of persuasive journalism is that they are indelibly marked with the sign of the commodity. The popular press was no less a product of the new industrial conditions that emerged during the 19th century than were the boot polish, stomach pills or packaged cereals whose advertisements filled the columns of the newspapers. Persuasion in the resulting "free market of idea" presupposes that there is indeed a market of idea, that it is free and that that is a good thing. The treatise, pamphlet, article, book or blog post thus takes its place proudly as a commodity on this market, confident that it will find just as many buyers as it is intrinsically worth. Or it takes its place grudgingly in some forlorn niche, resentful of the puffery and commercial pandering that propels unworthy screeds to the top of the ideological heap. Hold that thought while I check my stats to see if this has gone viral yet. The point is that criticism cannot win the free-market-of-ideas lottery because even if it does momentarily that only goes to show that the lottery wasn't rigged after all. Catch 22. The manifesto affirms at the level of metalanguage what it denies manifestly. Framing The New Charter of Industrial Freedom as a chart of accounts (with liturgical undertones) aims beyond superficial persuasion to deeper layers of inculcation, confession, calculation and reflection. I won't go into a detailed rationale here for the framing but instead will briefly reference a couple of sources that underlie that rationale: James Aho's The Religious, Moral and Rhetorical Roots of Modern Accounting and Rob Bryer's "Accounting and Control of the Labour Process." Bryer wrote of a capitalist mentality, inculcated by the accounting process, which uses the accounting information to control the labor process and minimize costs “by holding the collective worker accountable for the rate of return on capital.” In its broader historical context, as recounted by Aho, that bookkeeping originated with a moral and confessional purpose quite distinct from the purposes and mentality that evolved from it. One might even say that the evolved capitalist mentality glorifies and defends precisely those motives and actions that bookkeeping was invented to expunge as sinful (see also Weber's pessimistic conclusion: "fate decreed the cloak should become an iron cage."). Almighty and most merciful Auditor, We have followed most faithfully the devices and desires of our own pocketbooks. We have not strayed from thy bottom line. We have left unpaid those social costs which we could shift to others and we have amassed revenues from doing those things which we ought not to have done... And thereby we have successfully maximized return on investment and shareholder value. Amen! This is not to chastise the capitalist mentality for moral hypocrisy, though, but only to stress the efficacy of the bookkeeping technology at focusing and refining the "devices and desires" of those who employ it. But it is only efficacious insofar as its objects are conceived as commodities. A counter-mentality -- whether it calls itself socialist, trade unionist, ecological or anti-capitalist -- cannot be founded on the commodity-principle derived from the capitalist bookkeeping. But neither can it be founded on pure negation. In "Time on the Ledger," I have sketched a prototype of what such a social accounting process might look like. It is only an outline -- a stick-figure that can only be fleshed out through a broad collaborative effort. It is due to be published in May as Chapter 11 in Toward a Good Society in the Twenty-First Century: Principles and Policies. Also in May, I have been invited to participate in the Economics and the Commons Conference in Berlin. What I proposed in "Time on the Ledger" is a social accounting framework for evaluating the net social productivity of different hours of work arrangements. The basic idea is that first, there are fixed social cost to labor that are not reflected in capitalist accounting and the way that employers can shed their labor costs by laying off workers and second, there is a technologically-determined optimal length of working time per worker exceeding which subtracts from net social product over the longer period. The information from this process can guide collective bargaining and public policy advocacy while at the same time inculcating a commons mentality in practitioners. It is not enough to translate back and forth between capitalist accounting perspective and a commons ideal. One must become fluent in a new social accounting language. What appeals to me particularly about that liturgy is that it is performed as a dialogue between the minister and the congregation. It is, to be sure, a scripted and rehearsed dialogue -- a set piece, so to speak. Aside from any specific religious content, the ritual of this dialogue performs a vital centering purpose, opening up the mind and heart to a deeper level of receptiveness. It seems to me that such a centering ritual would be entirely appropriate for a group assembled to carry out a social accounting analysis. Organized labor’s millennium lasted exactly six years, two months, two weeks and five days. On October 15, 1914, U.S. President Woodrow Wilson signed the Clayton Antitrust Act. Samuel Gompers, founding president of the American Federation of Labor, hailed the labor provisions of that law as "the most comprehensive and most fundamental legislation in behalf of human liberty that has been enacted anywhere in the world", "the foundation upon which the workers can establish greater liberty and greater opportunity for all those who do the beneficent work of the world" and the "industrial Magna Carta upon which the working people will rear their structure of industrial freedom." Gompers gushed that the words contained in Section 6 of the Act, "That the labor of a human being is not a commodity or article of commerce," were "sledge-hammer blows to the wrongs and injustices so long inflicted on the workers." On January 3, 1921, in the case of Duplex Printing Press Co. v. Deering, the U.S. Supreme Court ruled that "there is nothing in the section to exempt such an organization [i.e., union] or its members from accountability where it or they depart from its normal and legitimate objects and engage in an actual combination or conspiracy in restraint of trade," thereby confirming an opinion long held by objective observers that the labor provisions of the Clayton Act didn't actually exempt unions from court injunctions. In the meanwhile, Gompers journeyed to Paris to lobby for virtually identical language in the Treaty of Versailles, affirming the official non-commodity status of workers everywhere: "Labour should not be regarded merely as a commodity or article of commerce." In 1944, the International Labour Organization reiterated as the first principle of its Declaration of Philadelphia that "Labor is not a commodity." Longson concluded from these observations of labor's peculiarities that, "I can only say I should be as ready to call a verb a substantive as any longer to call labour a commodity." Karl Marx was emphatic about the peculiar historical nature of labor – or, more precisely, labor-power – as a commodity. Rather than reject the label outright, though, he chose to examine it more closely. Marx observed that for labor-power to appear on the market as a commodity, the sellers must first be free to dispose of it (but only for a definite period) and also must be obliged to offer labor-power for sale because they are not in a position to sell commodities in which their labor is embodied. Connecting Longson's observation to Marx's, it would seem as though, aside from moral strictures, one of the qualities that most distinguishes labor-power from other commodities – its absolute and immediate perishability – is what compels its seller to submit unconditionally to the vagaries of demand. To paraphrase Joan Robinson, the misery of being regarded as a commodity is nothing compared to the misery of not being regarded at all. So if labor-power is not a commodity, or is only one due to peculiar and rather disagreeable circumstances, what is it, then? Consider the idea of labor-power as a common-pool resource. Labor-power can be distinguished from labor as the mental and physical capacity to work and produce use-values, notwithstanding whether that labor-power is employed. Labor, then, is what is actually performed as a consequence of the employment of a quantity of labor-power. Human mental and physical capacities to work have elastic but definite natural limits. Those capacities must be continuously restored and enhanced through nourishment, rest and social interaction. "When we speak of capacity for labour," as Marx put it, "we do not abstract from the necessary means of subsistence." It is the combination of definite limits and of the need for continuous recuperation and replacement that gives labor-power the characteristics of a common-pool resource. As Paul Burkett explains, Marx regarded labor power not merely as a marketable asset of private individuals but as the "reserve fund for the regeneration of the vital force of nations". "From the standpoint of the reproduction and development of society," Burkett elaborates, "labor power is a common pool resource – one with definite (albeit elastic) natural limits." "Common pool resource" is not the terminology Marx used; Burkett has adopted it from Elinor Ostrom's research. For Ostrom, common pool resources are goods that don't fit tidily into the categories of either private or public property. Some obvious examples are forests, fisheries, aquifers and the atmosphere. Relating the concept to labor is especially apt in that it illuminates, as Burkett points out, "the parallel between capital's extension of work time beyond the limits of human recuperative abilities [including social vitality], and capital's overstretching of the regenerative powers of the land." That parallel debunks the hoary jobs vs. the environment myth. The basic idea behind common-pool resources has a venerable place in the history of neoclassical economic thought. It can't be dismissed as some socialistic or radical environmentalist heresy. In the second edition of his Principles of Political Economy, Henry Sidgwick observed that "private enterprise may sometimes be socially uneconomical because the undertaker is able to appropriate not less but more than the whole net gain of his enterprise to the community." In fact, from the perspective of the profit-seeking firm, there is no difference between introducing a new, more efficient production process and simply shifting a portion of their costs or risks onto someone else, society or the environment. The opportunities for the latter may be more readily available. One example Sidgwick used to illustrate this was "the case of certain fisheries, where it is clearly for the general interest that the fish should not be caught at certain times, or in certain places, or with certain instruments; because the increase of actual supply obtained by such captures is much overbalanced by the detriment it causes to prospective supply." Sidgwick admitted that many fishermen may voluntarily agree to limit their catch but even in this circumstance, "the larger the number that thus voluntarily abstain, the stronger inducement is offered to the remaining few to pursue their fishing in the objectionable times, places, and ways, so long as they are under no legal coercion to abstain." In the case of labor-power, "fishing in the objectionable times, places and ways" manifests itself in the standard practice of employers considering labor as a "variable cost." From the perspective of society as a whole, maintaining labor-power in good stead is an overhead cost. The point is not to preach that firms ought to treat the subsistence of their workforce as an overhead cost. That would no doubt be as effectual as proclaiming that labor is not a commodity. As with Sidgwick's fishery, a greater advantage would accrue to firms that didn't conform to the socially-responsible policy. Ostrom explained the differences between various kinds of goods by calling attention to two features: whether enjoyment of the good subtracts from the total supply still available for consumption and the difficulty of restricting access to the good. Private goods are typically easy to restrict access to and their use subtracts from total available supply. Public goods are more difficult to restrict access to and their use doesn't subtract from what is available for others. Common-pool goods are similar to private goods in that there use subtracts from the total supply but they are like public goods in that it is more difficult to restrict access to them. If it were merely a matter of selling to employers, then labor-power would have the uncomplicated characteristics of a private good. Working for one employer at a given time precludes working for another. Hypothetically, the worker can refuse to work for any particular employer thereby restricting access. But here we need also to contend with that peculiarity of labor-power noted by the silk weaver, William Longson that a day's labor not sold on the day it is offered is "lost to the labourer and to the whole community." "If his capacity for labour remains unsold," Marx concurred, "the labourer derives no benefit from it, but rather he will feel it to be a cruel nature-imposed necessity that this capacity has cost for its production a definite amount of the means of subsistence and that it will continue to do so for its reproduction." This contingency and urgency of employment effectively undermines the worker's option of refusing work, so that in practice labor-power has the features of a common-pool good rather than of a private one. Collectively, the choice of refusing work is further weakened by competition from incrementally more desperate job seekers – a population Marx called "the industrial reserve army." So is labor a commodity or is it not? The arch, paradoxical answer would be "both." Examined more closely, the capacity for labor – labor-power – reveals itself as a peculiar commodity that exhibits the characteristics of a common-pool resource rather than a private good. An actual Charter of Industrial Freedom must address these peculiar characteristics rather than bask contentedly in the utopian platitude that labor is not a commodity.